From surfboards down to wetsuits, board shorts, and even wax–all petroleum-based goods–very few products in the surf industry are built to last and, as a matter fact, many manufacturers appear to be thriving on the planned obsolescence of their merchandise. This is especially true when considering the fact that, for the habitual surfer, wetsuits generally need to be replaced every two to three years. That’s a lot of non-renewable, non-biodegradable neoprene heading to the landfill. Outdoor clothing company Patagonia has teamed up with plant-based bio-rubber manufacturer Yulex to create a new wetsuit that is mostly made of Yulex’s bio-rubber which comes from guayule, a plant grown in Arizona that “requires very little water or chemical inputs to be grown,” says Patagonia’s Director of Surf, Jason McCaffrey. In 2007, a team of research biologists in a submerisble led by Monterey Bay Aquarium Research Institute (MBARI) Senior Scientist Bruce Robison found a deep-sea octopus, (Graneledone boreopacifica) clinging to a ledge at the bottom of Monterey Bay, about 4,500 feet down. On Satawal Island in the Caroline Islands of Micronesia, there are three kinds of men, and two kinds of sailors: those who can navigate are called Palu; those who can navigate using magic, called Pwo (held in even higher regard than the village chief); and then there are the rest, the “men who cannot navigate, who are not looked up to, and don’t have a name,” the late master navigator and mentor Mau Piailug explained. A former convict settlement where the descendants of the HMS Bounty mutineers were also sent, Norfolk Island is a tiny subtropical island situated between Australia’s Gold Coast, New Caledonia and New Zealand in the Tasman Sea. The island has a mild climate and current which make for comfortable temperatures year-round, and its lush greenness provides an endless supply of fresh fruit and veggies. Norfolk Island isn’t much of a tourist destination for many aside from retired couples and heavy-pocketed newlyweds, and its senior citizen population may lend it the reputation of being death’s waiting room for Australians, but you can drop me off there anytime you’d like. On a sandy beach in the Florida Keys last Friday night, a high definition camera captured about 100 3-inch-long baby loggerhead sea turtles hatch and make their way to the ocean. 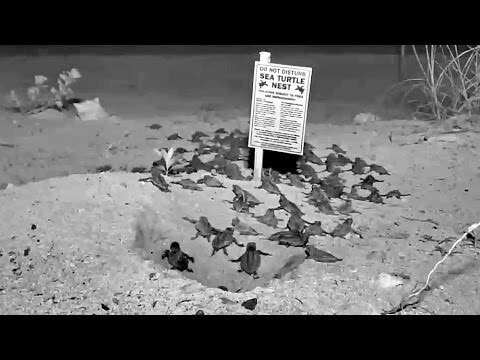 The camera uses infrared lighting so as to not distract the turtles from the moonlight, which leads them to the water’s edge. When you start catching too much trash in your fishnets, make furniture. That’s what these UK fishermen are doing, and they even have a furnace on board, so while some of the crew are hauling and clearing nets, others can be feeding the cauldron and assembling the stools, which they call sea chairs.